The explanations given by Israel to justify the onslaught on Gaza in last December were confused. The goals advanced by military and political Israeli apparatus varied, depending either on the person speaking or on the moment in which they were stated: from overthrowing the Hamas-led government and annihilating the movement, to putting an end to the launching of Hamas rockets from the Strip, to destroying Hamas’s military capabilities, to stopping the smuggling into Gaza, and so on. However, none of these stated objectives were met. The Hamas government remains in Gaza. Indeed, immediately after the cease fire was declared, the TV screens showed the Gaza police putting the streets in order while the armed resistance groups were firing rockets into Israel again. The message was clear: Hamas government holds power in Gaza, its capability to fire on Israel was far from being destroyed and the underground economy of Gaza continued to grow, becoming more and more sophisticated. But despite these facts, the Israeli establishment triumphantly declared that its war objectives were reached. How do we reconcile these statements with the reality? Should we interpret it as a sort of “cognitive dissociation”, a tendency to hold as “reality” what is constantly belied by the facts? Indeed this is a resilient historical trend in Israeli policy. However, there is another possible explanation: the objective may have been different, one that had more important and far-reaching consequences than simply overthrowing the Hamas government or obtaining some provisory gains - an objective that Israelis could not openly admit without contradicting its supposed stance - widely spread by Israeli propaganda- of “self-defense” and its eagerness for a “just and lasting peace”. The only way to reconcile facts and the Israeli public position and to decrypt the current Palestinian crisis is to expose the main aim and the strategy behind the “war on Gaza”. The objective of the assault was to consolidate the results of a campaign initiated long time ago during the Oslo agreements period itself: once and for all, to turn the Palestinian national movement into an unthreatening one and the Palestinian Authority (PA) into a mere administrator of the occupation with dictatorial trends. The strategy was based on deepening the division within the Palestinian camp and delegitimizing both armed and non violent resistance as viable political options. The long term prospect was clear: to force never-ending negotiations during which, due to its position of power, Israel could continue to create “facts on the ground” and impose its conditions to secure its expansionist idea of “Eretz Israel” (“Great Israel”), without paying any serious cost. One could argue that there is nothing new in this idea and that this has been the Israeli objective for the last five decades. Nonetheless, a closer examination of the situation sheds light on one significant difference, a difference that had forced Israel to change its strategy after the signing of the Oslo Agreements and at the same time better explains its current policy. Before the Oslo accords, Israel’s approach was almost purely a military one: to destroy those who Israel did not even recognize as Palestinians but as “Arab terrorists”. The infamous sentence of Golda Meir epitomized this idea: “there is no such a thing as Palestinians”. But the Oslo agreements put the Palestinian national movement back in some part of historic Palestine and made inexorable a political solution for its claims. To be sure, the only meaningful concession made by Israel in Oslo was to recognize the existence of Palestinian people and their claim as a political issue, something that it had flatly denied since 1948. Ever since Oslo, the Israeli approach has been accompanied by a “new Israeli strategy”. The military stance became insufficient. Israel could no longer simply kill Palestinians or expel them from occupied territory, but rather, it had to find a political response as well. By 2006 Israel was half way towards its objective. The PLO had virtually disappeared and, in practical terms, was replaced by the PA as the head of Palestinian national movement. The Fatah leadership in the PA was no longer a part of Palestinian resistance and was keen to accept an “Israeli solution to the conflict”. Only one major player, Hamas, continued to reject Israel’s unilateral solution, with a strategy of armed resistance and political negotiations. But, Hamas was no longer a political minority as a movement of resistance. It had become a political party with solid and wide popular support. In January 2006, it obtained a sweeping victory in the Palestinian legislative elections and was thus constitutionally authorized to form the next PA government. This unexpected development created a major crisis for Israel, Fatah and the U.S. administration. The fair and free elections had delivered an “Islamic-led government” that openly challenged Israel’s unilateralism, Fatah’s own political and economic privileges, and U.S. foreign policy. Hence to confront this new scenario, these three parties turned to history, employing old strategies against new enemies. To avoid the embarrassment of openly disrespecting the results of the elections, Israel, the PA and U.S. -albeit with different objectives- united and devised a “new strategy” of destabilization, propaganda and political and military plot against a democratically elected government. The U.S. is an expert in this technique, having used it at will around the world during the “cold war”. At the time, it was used against left wing social movements seeking political and social reforms. South America, for example, had to suffer a long history of civil wars, strong divisions and dictatorships as a result of these tactics. The strategy was always the same: political and economic destabilization, propaganda and military aggression. What happened with Hamas since its electoral victory in 2006 until the aggression of Gaza in 2008-2009 can be analyzed through the South American experience. The case of Chile in the period of 1970-1973 is an appropriate parallel. While the political context differed, in both Chile and Palestine, a plan of sabotage was set up, uniting foreign powers to internal groups to destabilize a democratically elected government. While the objectives in the two contexts were not identical, there were key similarities. As in Chile the plan culminating in the 1973 coup d’état intended to destroy the social movement and turn it into a functional part of a new economic and social structure, the sabotage of the Hamas-led government ending in the Israeli aggression on Gaza should be seen as a culminating act by the Israeli establishment to increase and consolidate the state of division, inactivity and self-defeat within the Palestinian movement. By so doing, Israel sought to eliminate resistance as a political option by forcing Palestinians, and specifically Hamas, to become a functional part of the structure of cooperation of the PA or to assume the consequences. The aggression’s objectives were not military but political. This article intends, through the Chilean comparison, to show that the Fatah-Hamas conflict does not represent a novelty but, rather, the application of an old strategy against a new enemy. It should help us to decrypt the internal dynamic of division and fighting that reins today in the Palestinian political landscape and allow to discard any ‘essentialist’ explanations of the conflict. In contrast to the way in which many may have started thinking about the issue, the internal crisis is not about a supposed “Palestinian politics” rooted in an essential “Palestinian character”, but about “politics in Palestine”: the current Palestinian deadlock has internal and external political causes and dynamics that can be identified and analyzed. We turn to the Chilean parallel to shed light on this. When former Socialist President Salvador Allende Gossens was democratically elected in Chile in 1970, the U.S. President, Richard Nixon, gave the order to "Make the (Chilean) economy scream" and to reverse, by ‘political or military means’, the results of the elections. The world was witnessing one of the peak moments of the “cold war”. The West’s foe at the time was the left wing and progressive movements, which were ‘imperiling U.S. economic interests around the globe’. The war in Vietnam had been a complete fiasco. The young Cuban revolution had survived all the North-American onslaughts (Bahia Cochinos failed invasion, sabotages, plots, propaganda campaigns and the long-lasting economic blockage). From the lens of U.S. foreign policy, there was no room for another Cuba. But, the Chilean case was a special one. Allende’s government was one of the first socialist governments to be democratically elected into office. Indeed, this feature had been perhaps the most symbolic pillar of the political platform of this government: the ‘Chilean (democratic) way to socialism’. Despite this fact, the Allende government was not spared a systematic U.S.-Chilean-right-wing plot to overthrow it. The multi fold plan included restrictions on President’s constitutional powers, severe economic boycott, activities of propaganda, political destabilization and a military intervention. Each step was to prepare the field for a coup d’état, which was to be presented to the world as the only solution for an ‘unsolvable and dangerous conflict’ between “communism and freedom”. A backbone of this strategy was the theory of the “internal enemy”. This was a central element of U.S. foreign policy in the region. It was taught first to the South American officers receiving U.S. military instruction and, then, spread around the population through the media and political campaigns. The theory was that there existed an international communist plot, which used local political parties to bring about communist dictatorships, and which aimed to destroy the culture, tradition of freedom and other founding values. Thus, the political conflict was turned into an existential one. The Chilean conservative forces started seeing the popular movement as a deadly threat not only to their economic power but also to their very existence. Now, any means were appropriated to defend themselves. A second element of the strategy was curtailment of the President’s constitutional powers. In 1970, Allende was elected in a very tight electoral fight. He obtained 36.3% of the votes compared to 35.8% by his closest right wing opponent. Since none of the parties had reached the absolute majority to be directly elected, Congress had to choose the new president. The constitutional tradition had been one where Congress nominated the candidate who won the highest number of votes. In this case it was Allende. Nonetheless, he was subjected by Congress to special conditions. To be nominated, the congress demanded that Allende sign a document that would restrict his range of maneuver, the “Estatuto de Garantias Constitucionales” (Statute of Constitutional Guarantees). Shortly after the new government came into office, economic boycott measures were put in place. Loans to Chile were frozen and the country could no longer provide the most basic supplies for its economy. The main international financial institutions along with Chilean and North American companies participated in the economic boycott, by cancelling financial projects and interrupting supply to the Chilean economy. Aid was maintained for only one purpose: support for social or political organizations that were strongholds for anti-Allende activity, including the military. Meanwhile, a propaganda campaign was carried out in full force against the government. During and after the elections, U.S. and the right wing dominated Chilean newspapers spread false stories to create fear in the population and alienate Allende’s political support: ‘the socialist government was receiving orders from Cuba and the Soviet Union’; ’children will be sent to Cuba and their parents to concentration camps’; and ‘the government was preparing to turn Chile into a dictatorship of proletariat without public freedoms or rights’. This campaign fueled fear, hatred as well as internal social and political divisions. This propaganda machinery was well-financed by CIA and other institutions, and meanwhile the government was not even able to finance its basic social projects. In addition, a parliamentary coalition (of right wing-Christian Democrats) was formed to block the President’s political initiatives. In 1972, a strong political campaign against members of government was initiated. The opposition parliamentary coalition had the majority to dismiss the ministers. In three years, Allende had to form six governments. This state of affairs was to be exacerbated by an increasing militarization of the conflict, chiefly by substantial increases in material support to the Chilean military. Thousands of high officers of the Chilean army had been trained and introduced to the theory of the “internal enemy”. In the same way, the CIA armed, trained and supported the most radical reactionary forces within the Chilean right wing. The strategy yielded fruits. An unprecedented social and political conflict lead to a total destabilization of the country: People queuing for bread and the most basics supplies; clashes between political factions; strikes; incendiary speeches; calls for armed actions from both sides and accusations of sedition and treason; political assassinations; and bombing of bridges, railways and other public facilities. In this scenario, calls from the Chilean right wing for direct intervention by the army escalated. Preparations needed to be made for such an intervention. A key element of this was the unveiling of a fabricated document in August 1973, the so called “plan Z” masterminded by the CIA and Chilean right-wing. The document supposedly revealed that the left wing was planning to physically liquidate thousands of officers and their families, whose names were listed in it. It spread panic in military ranks and consolidated support for a coup d’état at all levels of the army. Now, it was only a matter of time and coordination. Considering the overall state of affairs in the country, Allende decided to call for a referendum to allow the population to decide on the future of his government. The date to call for the referendum was set for September 12th, 1973. But the U.S.-Chilean right wing alliance was at unease. The latest legislative elections in March 1973 showed that the government’s coalition had strong popular support. The right wing alliance had no interest in an electoral exercise, which could further consolidate Allende’s power. At dawn on September 11, 1973, military actions were undertaken in the capital, Santiago. A military “junta” claimed that it had assumed power over the government and declared the state of emergency. The presidential palace was surrounded by the army and the “Junta” demanded that the President surrender. These demands received a flat rejection from Allende who, in a final speech from the presidential palace, declared that he would rather die than give up his popular mandate. The “junta” ordered the bombing of the presidential palace by the air force. By the end of the day, the Chilean democracy was broken, the government was overthrown and Allende himself was dead. Thousands of people were arrested, tortured, killed and others disappeared. Thousands of others were exiled. A new dictatorial military government was installed headed by General Augusto Pinochet. It constituted a strong alliance between military forces and the Chilean right wing widely supported by the U.S. administration. U.S. support for the new government was immediate. Even within days after the coup d’état, people no longer had to queue for food. Supplies to the Chilean economy resumed and international credits were again made available for the “new Chilean government”. Most of the legal, economic and political measures undertaken by Allende’s government were undone. After a few years, more comprehensive economic and legal reforms were undertaken, including total economic liberalization. Throughout its period in power, the military “Junta” also put in place a repressive political and social regime. Social movements were repressed, labor unions were dismantled and political parties were forbidden. The Chicago School of Economics and its neo-liberal principles were to serve as the guide to the path of economic reforms. The military government was especially successful in ensuring profits for multinational enterprises and the upper economic class of Chilean society. Meanwhile, the poorer segments of the population were left to pay the high price for economic adjustment of the country. The political elite in Chile (both the right and left) -which is rooted in the economic elite- benefited from the flourishing of big businesses. Former revolutionaries became managers of international and local companies. Others undertook their own industrial or commercial ventures or became economic or political consultants. The left wing elite became a dynamic part of the Chilean business world and deepened its ties with the economic right wing and with the new Chilean economic system. The country’s economy was now privatized, opened to the international trade and displayed as an economic model for South America. Its macroeconomic rates improved all throughout the 1980s, only with the exception of salaries, the distribution of the country’s wealth and poverty. In 1980, the process initiated in 1973 was to be sealed with the promulgation of a new political Constitution that was approved in a doubtful electoral process. The legal text sanctified the ideological principles carried forth by the dictatorship and its right wing supporters: a neoliberal economy and a conservative “protected democracy” that assured political over-representation of the right wing and gave to it a power of veto over all major political or economic reforms in the country. Following the referendum of 1989, democracy was restored in Chile in 1990. But, the world had changed significantly, most notably with the demise of the Soviet Union. The Chilean left completely abandoned its former program. The left political elite was by now fully incorporated into the neoliberal economic system and was enjoying significant material benefits. This trend was to be deepened after some years in office. The center-leftist coalition that has ruled the country for almost nineteen years has been a mere administrator of the former military government’s political and economic legacy. The 1980 constitution is the only law in the land and social movements seem to be contained within a neoliberal and conservative status quo. As Allende in Chile, the electoral victory of Hamas in January 2006 was historical. For the first time in the Arab world, an Islamic movement was democratically elected to parliament and the government. It was as well a political event fraught with important potential consequences. Their victory was threatening for Fatah-PA, Israel, the neighboring Arab authoritarian regimes and for the U.S’s. “New Middle East” conception. Each of these actors had different reasons to ensure the failure of a Hamas-led government. Fatah leadership wanted the Hamas government to be overthrown to recover PA institutional power and unhindered access to PA financial funds and commercial interests. Neighboring Arab countries were disturbed with the presence of a democratically elected “Islamic government” at their doors while they were repressing their own “Islamists” at home. Moreover any outward support to Hamas would disrupt their relations with Israel and the West, whose financial support they are dependent on. For the pro-Israeli Bush administration, getting rid of Hamas was framed within its mantra of the “war on terror” and as part of its unconditional support to Israel. For Israel itself, it was a chance to further debilitate the Palestinian movement by strengthening division to unexpected levels and to liquidate it politically, from inside. Dealing with this new Palestinian political landscape required the re-deployment of a proven and efficient strategy. The Chilean formula was to be reapplied: An alliance between a Palestinian internal group and foreign powers was formed and a plan was set up, which included severe economic boycott, activities of propaganda, political and social destabilization and military intervention. Once again, each element of the plan was meant to prepare the field for a coup d’état, which was to be presented to the world as the only solution for an ‘unsolvable and dangerous conflict’ this time between “moderates” and “fundamentalism”. The co-optation of this group started during Oslo. At the time, Fatah leadership agreed to a key Israeli condition of “delivering security” to obtain advances in the negotiations, knowing well the benefits and privileges they would in turn receive with the establishment of the PA. The PA leadership’s first step was to silence its closest political opposition. It progressively sidelined the PLO, which was left languishing and only reactivated, when necessary, to “legitimize” Fatah-PA political decision-making. PLO outsiders suffered from military and political repression. All forms of resistance, especially armed struggle to Israel, were contained. The main target was Hamas, whose members became intimately familiar with PA jails, and were subject to political harassment and torture. The 2006 Hamas victory came as something of a shock for the Fatah leadership. Its political and economic interests were seriously threatened. Therefore, Fatah tried, at the price of Palestinian unity, to hold political power through a variety of tactics. This included breaching the constitutional framework that some years ago a Fatah parliament had approved and participating in a political and military plot to deprive Hamas of its electoral victory. Within the Fatah leadership, Israel and the U.S. had found their allies to accommodate their own agendas. As in the case of Chile, a range of constitutional and legal measures were adopted to restrict powers of the elected government even before it came into office. Foreseeing a potential victory for Hamas in the legislative elections, Fatah parliament members introduced a proposition for constitutional amendments during a meeting of the parliament in 2005. The proposition tried to strengthen the President’s legislative powers; to give the President the power to call for referendum and the right to call for early elections (dissolving the PLC) under several scenarios, some of which strikingly resembled situations that transpired after the election of Hamas. But the amendment was not approved, perhaps reflecting the overconfidence that Fatah still had at the time regarding the elections. A few days before the elections the motion was re-introduced but, on two occasions, the parliamentary quorum was not reached. Apparently Fatah members were too absorbed in their campaigns. The economic boycott was also a central element of the destabilization plan in Palestine, as it had been after the victory of Allende in Chile. In fact, the Israelis made no efforts to even mask this objective. After election results in 2006, Dov Weisglass, an adviser to Ehud Olmert remarked nonchalantly: it [the planned boycott] will be “like an appointment with the dietician. Palestinians will get a lot thinner, but won’t die”. The first moves from the U.S. and Israel took place immediately after the victory of Hamas in the elections. The Bush administration and other countries suspended financial aid until certain conditions were met: Hamas’s recognition of Israel and its “right to exist” (without demanding from Israel the acceptance of a Palestinian state), renunciation of violence (that is to say resistance) and acceptance of the terms of prior agreements between Israel and the PLO. Hamas rejected these conditions and international aid was completely frozen, with the exception, of course, of money directed to strongholds of anti-Hamas activity and the Fatah political and military apparatus. In June 2006, international donors created “TIM” (Temporary International Mechanism) and later “Pégase” to channel financial aid into Palestine by bypassing the Hamas government. No official international aid arrived to the Hamas government accounts. 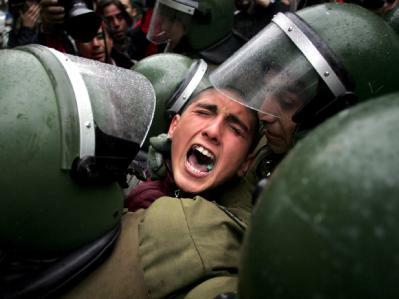 As in Chile, the boycott created economic crisis, political destabilization and social turmoil. The government could not meet its payroll, thousands of Palestinians did not get their salaries for months, demonstrations broke out, and armed inter-faction clashes took place. Public sector workers went on strike, the operations of most government institutions came to a halt, schools were closed, and medicines were in short supply. The plan for the Palestinian “diet” was working well, except for the fact that Hamas government remained firmly in power. The U.S. administration tried to up the ante by opposing a Fatah-Hamas negotiation to form a national unity government. Simultaneously, it pressed the Palestinian President (Fatah) to dismiss Prime Minister Haniyeh’s (Hamas) cabinet. Despite U.S. and Israeli pressures, Fatah and Hamas reached an agreement to form a national unity government on February 2007. Nevertheless international aid continued to be blocked and the Fatah-Hamas divide escalated. "…You are not here to confront Israel, the conflict with Israel has until now led nowhere. You must show the Israelis that you can do the job”. -Former PA Interior Minister General Abdel Razak al Yahya speaking to young Palestinian recruits in a military training camp near Jericho. Confronted with a resilient Hamas that continued to hold power, the U.S. administration launched a plan for a coup d’état in 2007. Its objectives were to remove Hamas from power and replace it with a Fatah government that accepted Israeli-U.S. conditions. The plot , codenamed “Plan B”, had several dimensions: security, economic, political and public relations. A first informal draft which lays out the foundations of the plan can be found in a document called “Talking Points”. This document was a memo of the discussion, in October or November 2006, between the State Department envoy Jake Walles and the Palestinian president Mahmoud Abbas. According to the document, “Hamas should be given a clear choice with a clear deadline…they either accept a new government that meets the Quartet principles, or they reject it…If Hamas does not agree within the prescribed time, you (Abbas) should make clear your intention to declare a state of emergency and form a emergency government explicitly committed to that platform…If you (Abbas) act along these lines, we will support you both materially and politically…”  to deal with the likely backlash from Hamas. The details of the plan can be found in another document titled “An action plan for the Palestinian presidency” drafted by U.S., Jordanians and Palestinians officers. Its security appendix reveals details of the secret talks between Palestinian Fatah strongman Muhammad Dahlan and Lieutenant General Keith Dayton. With the publication of this document the armed clashes between Fatah and Hamas re-commenced. To prepare for the move, Fatah started recruiting and training a new kind of military personnel and acquiring more sophisticated arms. Young men coming from humble social contexts were the main target of these efforts. The objective: to replace the old cadres who were considered “too politicized” and engaged in resistance against Israel with new troops trained in crowd control and counter insurgency in military camps in Jericho as well as in Jordan and Egypt. The idea was to form new security forces more loyal to orders from their superiors than to the principles of resistance against Israel. 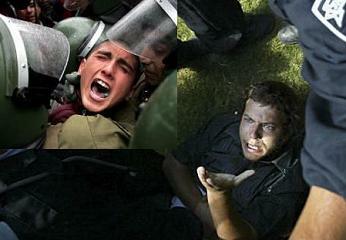 By this time, in early 2007, Palestinian society was confronting a major political crisis with features of a civil war. Strong Fatah-Hamas armed clashes were taking place and the PA President threatened to call for a referendum or early legislative elections. Rumors of an imminent coup d’état  further poisoned the situation. In mid-May 2007, these fears took root with the arrival of 500 new Egyptian-trained recruits loyal to the Palestinian President. On June 7, the Israeli newspaper Haaretz made public the fact that Abbas was negotiating with Israel for authorization to receive a heavier arms supply from Egypt. There were also rumors that Fatah was mobilizing troops towards Gaza. Unlike the Chilean left, Hamas had prepared its troop for such event. On 14 June 2007, in a pre-emptive measure, Hamas undertook military action resulting in a total takeover of all PA security and political apparatus in Gaza. The action was ironically labeled by Fatah as a Hamas coup d’état. Abbas declared the state of emergency and dismissed Prime Minister Haniyyeh and his cabinet. In his place, the President appointed a new Prime Minister (Salam Fayyad) to form a government that completely excluded Hamas. Hamas continued to hold power in Gaza. Following these June 2007 events, both factions launched their own media war. The theory of “the internal enemy” was aptly applied in Palestine, escalating the internal conflict to new levels. The “Emergency Government” of Salam Fayyad created in June 2007 has been ruling the West Bank outside constitutional legality. Nevertheless, Israel, U.S. and the EU have given their total support and international financial institutions and donors have resumed aid for this government. Meanwhile, Abbas has been using a range of legal and extra-legal means to consolidate his power and marginalize Hamas politically. Currently, a long list of ministerial and presidential decrees governs the West Bank, excluding Hamas from the PA and repressing internal opposition and resistance to Israel. Despite participation in several rounds of meetings with Hamas to solve the internal deadlock, PA-Fatah has concomitantly overseen a crackdown of Hamas in the West Bank. In all the major cities of the West Bank, the Abbas government has mobilized its forces; a “police quasi-state” has been set up, one which entails repression and arrest of dissidents; Hamas military forces are outlawed; Hamas-linked charitable NGO’s are closed; freedom of speech exists only in appearance; amendments to the law are made by presidential decrees, including the electoral law; and some efforts are made to renew the PLO as a way to bypass the paralyzed PLC. The final objective of all these measures is to prepare the field for legislative elections that will assure a Fatah victory. Most recently, the Abbas government undertook the decision to withdraw its support - in the Human Rights Council of the United Nations- for the “Goldstone report”, which attempted to bring Israel to account for its crimes in Gaza. This decision sent shockwaves in Palestinian society widening the internal division. Yet, tactics of fear and repression by the government, popular political demobilization, and lack of any serious opposition in the West Bank mean that the political consequences of even this decision will likely remain limited. It is in this context, that Abbas’s regime has been hoisting its intention of negotiating an end to the internal Palestinian conflict. Maybe the fear of Abu Jihad is already a reality: treason has become an opinion from where one can negotiate. Ever since the events of June 2007, there are no longer only two main rival factions within the Palestinian national movement but two PA governments fighting against one another, ironically for the pieces of a non-existent power. The “trap of statehood” has seduced Hamas as well and is destroying the Palestinian national movement from the inside. Israel just “needed to help them defeat themselves”. The motto was to deepen confrontation and division and “to keep them going in this direction”. The Israeli aggression in Gaza in 2008-2009 was undertaken to serve this purpose. Fundamentally, the aim of the aggression was to bring the cleavages and divisions within the Palestinian political camp to a level of paroxysm. While in the case of Chile, the internal group had succeeded in the coup, in the case of Palestine they did not. After Fatah’s military failure in June 2007, Israel stepped in, albeit with different objectives. That is how the “war in Gaza” should be understood. To be sure, annihilating Hamas movement was not a real objective of the “war”. Hamas has become a mass movement and, in many ways, a real political party. To destroy it means to physically destroy a significant portion of the Palestinian population itself. Otherwise, new militants would replace those who are killed, as was the case with Hamas’ leaders Ahmad Yassin, Abdelaziz Rantisi and many others. Israelis had learned this lesson on many occasions -the aggression of Lebanon in 2006 being the most recent. Hezbollah came out reinforced after 33 days of shelling, as Hamas has been reinforced now. Today it is clearer than ever before that no possible solution to the Palestinian crisis can be found by ignoring Hamas. The war on Gaza was also not made to stop Palestinian Hamas rockets. Why would Israel provoke a war to obtain what it already had through political negotiations? In 2008, an Egyptian brokered unwritten cease-fire fundamentally comprised a bilateral end of fire and the lifting of the Israeli blockade of Gaza by opening the crossing points. Effectively, from June 19 to November 4, 2008, the number of rockets falling into Israel decreased significantly. The Israeli Prime Minister’s spokesman even admitted that there were no Hamas rockets launched during the period. While Hamas maintained the cease fire between 19 June and 4 November , Israel managed to kill a number of Palestinians during this period, never opened the crossing points nor extended the cease fire to the West Bank. Hamas was willing to renew the deal as long as Israel met its terms, and they let Israel know this. But Israel decidedly did not want a new deal. It had many tactical reasons not to agree to a new cease fire but, chiefly, it saw a “war on Gaza” as a great opportunity to work towards its main objective. This objective is to make Palestinians accept the Israeli political solution to the overall conflict: the “only Jewish Great Israel”. This plan completely disregards international legality and deprives Palestinian of their national rights. Israel rejects withdrawing to the 1967 armistice lines (UN resolution 242) and the return of refugees or their compensation (UN resolution 194). Israel refuses to give up East Jerusalem and only offers limited autonomy for several enclaves in the West Bank and Gaza without real sovereignty. To succeed, Israel has to debilitate the Palestinian camp to the extent of forcing it to accept its unilateral and illegal solution. The aggression on Gaza was another step in this direction. Nevertheless, Israel needed some Qassam rockets to fall into Israel in order to justify the aggression. It waited for the perfect moment to deliberately provoke Hamas fire. On November 4, Israel carried out a military operation killing 6 fighters, exactly at the moment when the world was absorbed in the U.S. elections. Israel’s actions received little media coverage. Subsequent to this provocation, rocket attacks commenced from the Gaza side. The Israeli propaganda machine could hence present its aggression as an act of “self-defense”. The intentionally massive destruction of Gaza and the killing and wounding of thousands of Palestinians served Israeli strategy in two ways. First, it showed that Palestinian resistance has a high, potentially intolerable price. This was done by making the Palestinian civil population suffer a high human and material cost and then blaming Hamas for it. The strategy was in fact set down in Lebanon in 2006. Among Israeli circles, it was called the “Dahiya Doctrine” : “…wield disproportionate power against every village from which shots are fired on Israel, and cause immense damage and destruction… This isn’t a suggestion. This is a plan that has already been authorized.”  “The answer … is a disproportionate strike at the heart of the enemy's weak spot, in which efforts to hurt launch capability are secondary…"  The aggression in Lebanon in 2006 was actually disproportionate and immensely destructive. In all certainty, this level of violence and destruction was premeditated and part of a larger strategy32. It was about convincing the Palestinian camp that resistance will be squashed at any price and that there cannot be hope in resistance as a political option. The message went through: Palestinian resistance can choose between submission and death. Put between the wall and the sword, Hamas seems to choose the sword. The rockets continued falling into Israel. This gesture will surely not be overlooked in Palestinian streets33. The second dimension of the strategy in Gaza was to deepen the divide within the Palestinian national movement and prevent Palestinian unity. It is for this reason that overthrowing the government in Gaza was not a priority for Israel. From the Israeli perspective, what is preferable? Having one strong Palestinian government more able to focus its efforts against occupation, or to have two Palestinian governments counteracting and delegitimizing each other? The political division in the Palestinian Territories has reached an unprecedented level, where there is no room for political trust or for patriotic loyalty. This crisis has shown that the two main Palestinian parties no longer consider themselves as mere political opponents but as enemies. In fact, Hamas recently raised the accusation that some Fatah-PA officers were helping and assisting the Israeli army during the bombing of Gaza.34 Given the position of Fatah-PA after the legislative elections of 2006 and during the Gaza aggression, Hamas understands that it not only has to endure a strong political opposition from Fatah, but that it is their target for physical liquidation. Solving this confrontation will take a very long and, meanwhile, the Palestinian national movement is stalling: with not one but several voices; without a clear program or strategy; absorbed in the internal deadlock; loosing internal and international legitimacy; and unable to confront occupation in any meaningful way. The situation cannot be better for Israel. We should expect it to continue pushing in the same direction. Who will now collect the fragments of the Palestinian national movement? Emilio Dabed is a lawyer, specialized in constitutional matters. He holds a Masters degree in Political Science and is currently finishing a Ph.D at IREMAM (Institut de Recherche et d’Etudes sur le Monde Arabe et Musulman, Aix-en-Provence, France) on the constitutional process in Palestine. He can be reached at emiliodabed@yahoo.fr. For instance, in 1970 Israel took part in convincing King Hussein of Jordan to repress and expel PLO from his country. “Black September” left thousands of Palestinians dead. PLO reinstalled its HQ in Lebanon, but In 1982 Israel invaded Lebanon. Thousands more were killed and PLO fighters had to leave and re-establish its HQ in Tunis. On October 1, 1985, Israel attempted to kill Arafat with an air raid on his headquarters in Tunis. He survived, but 60 members of the PLO were killed. In this article the expressions “The mainstream of PLO”, “Fatah leadership”, “Fatah-PA”, refer to a very select group of persons who were and, still today, are involved in PA decision-making. Indeed, Fatah is a party constituted by very diverse groups of people and it cannot be seen as a monolithic movement. The Palestinian national charter was amended in 1996 to this aim. CIA Director Richard Helms’s notes of a meeting with Nixon and other U.S. officers on the Chilean situation. http://www.gwu.edu/~nsarchiv/NSAEBB/NSAEBB8/nsaebb8i.htm. See Jean-François Legrain, L’IMPASSE POLITIQUE ET INSTITUTIONNELLE PALESTINIENNE, critique international N° 36, juillet-septembre 2007. See for exemple “The Peace Business. Money and Power in the Palestine-Israel Conflict”, Markus E. Bouillon,I.B. Tauris, London, 2004; Mushtaq H. Khan, State Formation in Palestine : Viability and Governance During A Social Transformation, Routeledge, July 2004; Peter Lagerquist, “Privatizing the Occupation: The Political Economy of an Oslo Development Process,” Journal of Palestine Studies, Vol.32, No. 2, 2003. In the last political program of the Fayyad government, the word resistance (Muqāwamah), a symbol in Palestinian political platforms, has completely disappeared. Zakaria Al-Zubaidi, former commander in Martyrs al-Aqsa brigades, Haaretz, on April 13, 2008. The rationale was to prevent Hamas from having control over the security apparatus. That is why Hamas government created a new security force, the Executive Force, in April 2006. After that, the PLC was unable to convene since it lacked the quorum to do so. Fatah did not attend PLC meetings to prevent it from functioning and avoiding legislation contrary to their interests. The document was published in Jordan: « Khitta ‘Amaliyya li-l- Ri’âsa al-Filastîniyya li-‘am 2007 », al-Majd (Amman), On April 30, 2007. Mark Perry, Paul Woodward, « Document details « U.S. » Plan to sink Hamas », Asia Times, 16 May 2007. In interviews with the author, many Fatah supporters have communicated the instinctive hatred they bear for Hamas and tend to describe them as “politically fanatical, bloodthirsty and socially backward”. The Palestinian Basic Law does not authorize any government to enter into office before receiving a vote of confidence from the PLC. The Salam Fayyad government has never met this condition. Hamas arrests Gaza rocket squad after two Qassams hit Negev." Ha'aretz, 10/7/2008. Dahiya is a suburb of Beirut considered a Hezbollah stronghold. This place was severely destroyed during Israel's attack on Lebanon in 2006. Gadi Einsekot, commander of the Israeli military’s northern sector. Ha’aretz, October 5 2008. Colonel (Res.) Gabriel Siboni, Ha’aretz, 5 October 2008. Samouni family lost 29 members in a matter of seconds. Their case has been presented as one of the main legal cases against Israeli actions in Gaza. Recent opinion polls show that, as long as there is occupation, resistance will be one of the greatest sources of internal Palestinian political legitimacy.